I reckon I can fit one or two more in before the end of the year... plus I wanted to post a record with a wintery cover, 'tis being the season and all. Although I'm thinking snow might not be very present in many parts of the world where this is being read... matter of fact it's not much present in Oslo at the moment either. But I digress. Ages ago I wrote that 'Chura Liya' from 'Yaadon Ki Baaraat' was my favourite ever Bollywood song. 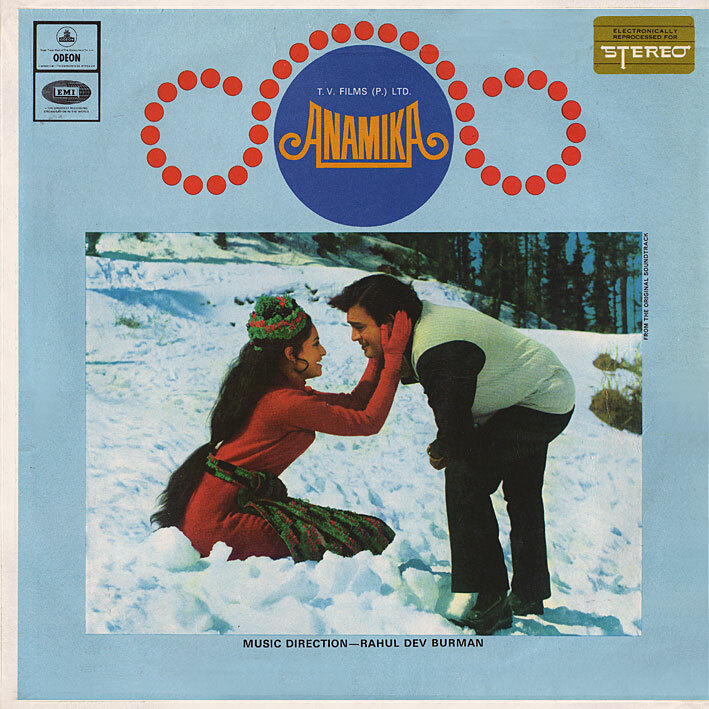 That may actually have been a premature assessment, as at the moment I can't think of anything more perfect than the gobsmackingly amazing 'Aaj Ki Raat' from 'Anamika'. With a cool spoken intro I for once don't fast forward through, the wickedest psych-tinged guitar line, an atmospheric yet groovy and totally mod beat, Asha Bhosle sounding seductive as sin (and I have no idea what she's on about) - this one song encapsulates everything I like about Bollywood music from the period. Flawless. The rest of the soundtrack inevitably pales in comparison. 'Logo Na Maro Ise' is nice and upbeat and would be a highlight of most other scores, 'Baahon Men Chale Aao' is a trademark mid-tempo Burman number, 'Meri Bhigi Bhigi Si' sounds altogether lovely... in all a very good album, but it really is for 'Aaj Ki Raat' alone that it gets filed under absolutely indispensable. Ya , Aaj Ki Raat is one of my favorites too! Nice songs, and after seeing the picturization that posted of Helen in the nighclub scene, well, I had to add this movie to my Nehaflix.com order! We never had great TV growing up, so I used to wait eagerly for the weekly Wednesday Hindi movie. Even though I never understood a word of them, they were always great. Honestly, thanks for this site! You've put a smile on my face for months to come! Thanks for the winter reminder, btw. Its snowing outside my window right now so I rather go to Calcutta or Delhi. I believe you mentioned you had the vinyl of SHAAN (1980). If you do, I wanted to know when you were going to post that, its a rocking album. Thanks a million for all these vinyl rips of yours. I can't get enough of THE BURNING TRAIN, and HUM KISISE KUM NAHIN, amazing quality and two outstanding albums. In about a month or so I reckon, there's a few others I have lined up first. Alright Thanks, looking forward to that !. You forgot one of the best parts of Aaj Ki Raat: the amazing bass playing. The other tunes may not be as amazing, but this soundtrack still has more good tunes than many soundtracks with twice as many songs. Would you by any chance happen to have RDB's "The Train" (1970) ?. It was released by Polydor, and it's a rocking album !. Thanks so much for all your albums !!!. No afraid not, it's on my want list though. Thanks for the reply PC :). i can't download these songs..there are no links to the mp3 download. Yes there is, in the first comment. Memsaab sent me over. Fantastic blog. Aaj Ki Raat is the bomb indeed. This may have too much of a self promotional point on it (and feel free to not publish) but my band Autorickshaw did a cover of this song (blasphemy, I know) because we loved it so much and simply couldn't resist ;) and i thought I'd share. Care to post image of Side B as well. Sorry, but I made a conscious decision early on to limit scans to the front cover. Mostly to save time.